Let it be known that my competence in music is way worst than my knowledge of IT. Only by way of example, I have owned two guitars in my life: both ended up broken under the bum of a friend who sat on them. That’s a clear omen, which I better pay heed to, as one should do with all omens. All I got off that quick frequentation, is a couple of lines Guccini’s La locomotiva, which I also think I get wrong (sorry, non-Italians: you are not expected to know Guccini). Back in the days, I had even picked bits of the opening arpeggio of One, but I quickly forgot it. All in all, you don’t want to invite me to a dinner for my skills as a musician. Once, I even longed to enrol to the conservatory. I just had my Damascus experience on seeing a lute player in a calle of Venice and wanted to emulate him. I discovered, to my frustration, that I was already too old to enroll for any instrument (Gianola says it’s never too late. But I am teaching him Muay Thai, and I suspect he’s being a flatterer, lest I remember his frankness over a sparring session). Despite being totally music-unsavvy, however, I have been requested to make a fragrance inspired by music, and I wanted to talk about it. The fragrance was requested by Bruce, a sophisticated English gentleman who usually wears an unmistakable, classic fragrance with earthy, metallic and fresh green notes. – Do you know Le jardin de Dolly? A bit bewildered by the challenge, I thought it would be stimulating to take on. I said yes, I will commit to it. Then, I spent the very next weekend sifting through the different executions of the piece, and went into voluntary seclusion trying to get to the soul of it, until I felt I would be able to translate it into an odorous path. I tried to capture the infinite tenderness of the overture, the composer’s resolute gazing at the girl, while she roams loose in the garden, the playful chase of the shades and the fountains, and the smell of freshly laundered cotton. I was not entirely happy with the result (after all, it comes well before Mitting Attar, on which I will write soon) and, although Bruce liked it, I am quite certain the attempt fell quite wide of the mark. To Bruce’s disappointment, every time he requests a refill, I keep providing him with something different each time. Oh, right: how did ancient Greeks listen to music? I have no clue really, but the idea I have made up for myself is a romantic one and it is rooted in my own representation of Plato’s death. It an account accrued on a documentary core, which has developed over time incorporating other images in that chord of my memory. The result is a new account of the same story, which is perfectly real in my mundus imaginalis: Plato gradually loses his senses accompanied by a melody of flutes and, surrendering the sturdy body to beauty. As he passes away and the soul takes the first step toward the principle, he indicates, with a movement of his finger, the Measure to a Thracian girl playing the flute to him, as she could not find the beat of the nomos (1). In the air, fragrant smoke exuding from perfumed essences oozes from the altars (2). Overall, it is a music that one listens to, but hearing is not the only sense involved: the beauty of melody involves the sight and the smell too. My personal ‘death of Plato’, whose sequence I extend, a bit arbitrarily perhaps, to the classical antiquity at large (the classicists please help), has generated a reflection that I have made while I was attending a gig in London, with Gioia: today, the fruition of music (in particular live music) tends to be mutilated: scents are missing. Not a big deal, to be sure; the omission may even be justified to some extent. However, like in the the case with poetry, which was born to be accompanied and complemented by music, music may in turn benefit from the accompaniment of smells. In spite of the broken guitars, therefore, music and I may soon cross paths again in a new guise. (1) In fact, there are basically three different accounts of the death of Plato: the fourth, my version, is based on the one reported in a an anonymous manuscript that came down to us only in a fragmented form. According to another account, reported by Diogenes Laertius, Plato passed away during a wedding banquet. Tertullian has him simply dying while sleeping. 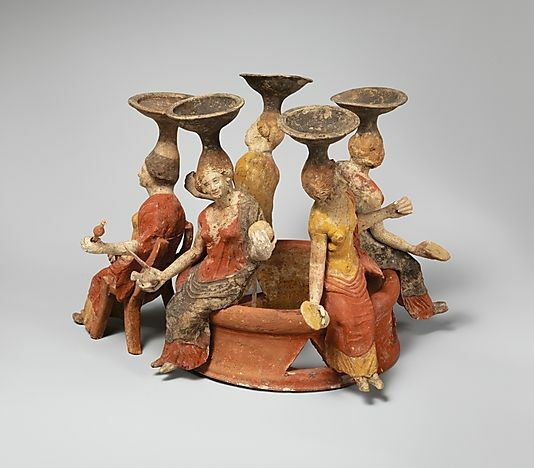 (3) Thymiateria were mobile altars used as incense burners during sacrifice rituals. Ancient Greek language has a technical term used to indicate the ‘offering to the gods through fire, in the amount due to them’: thymìana.